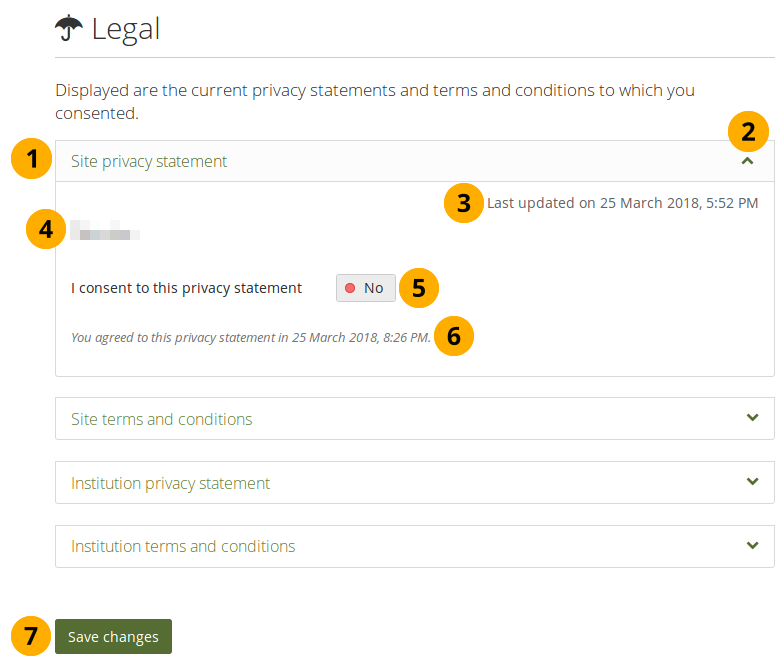 Displayed are the current terms and conditions and privacy statement for the site. If you are a member of an institution, you also see the institution privacy statment and terms and conditions if your institution set them up. If „Strict privacy“ is turned on for the site that you use, you must decide whether you consent to the statements or not. Title of the legal statement. There can be up to 4 statements that you may need to consent to. This depends on the setup of the site that you use. Click the Retractable icon to close this section. This is helpful if the texts are very long. The date the statement was last updated is displayed. The text of the statement. Your previous decision of consent is displayed. If you do not consent to the text anymore, e.g. because it was updated with unfavourable terms, flip the switch to „No“. The date and time when you consented to each statement is displayed. Click the Save changes button to accept your decisions. If you do not consent to one of more of the statements, you are presented with the following screen. Enter a reason for refusing consent to one or more of the legal statements. Click the Yes button to send your refusal message to your institution administrator. If you made a mistake and do want to consent to all statements, you can click the No button and go back to the previous page. If you decide to send your reason for refusal, your account will be suspended, and your institution administrator (or the site administrator if you are not a member of an institution) will receive a notification about the refusal. They can then get in touch with you to discuss your decision.